My first window quilt is complete, after sitting in various stages of progress for literally years! 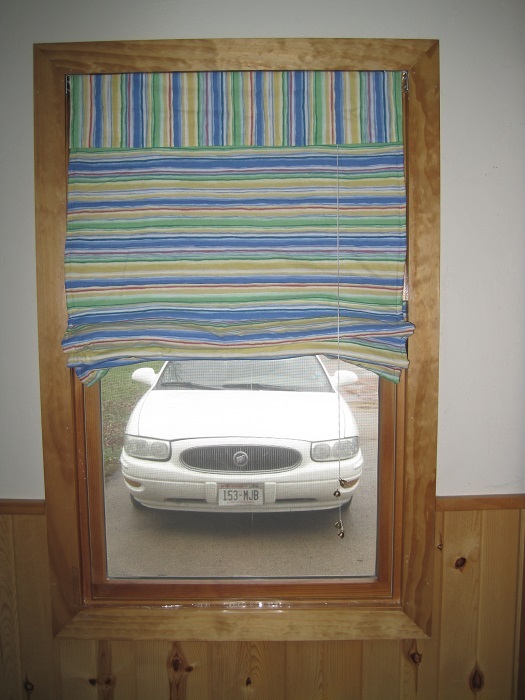 The window-facing side is made from a patch work of old jeans, inspired by the Quilts of Gee’s Bend. 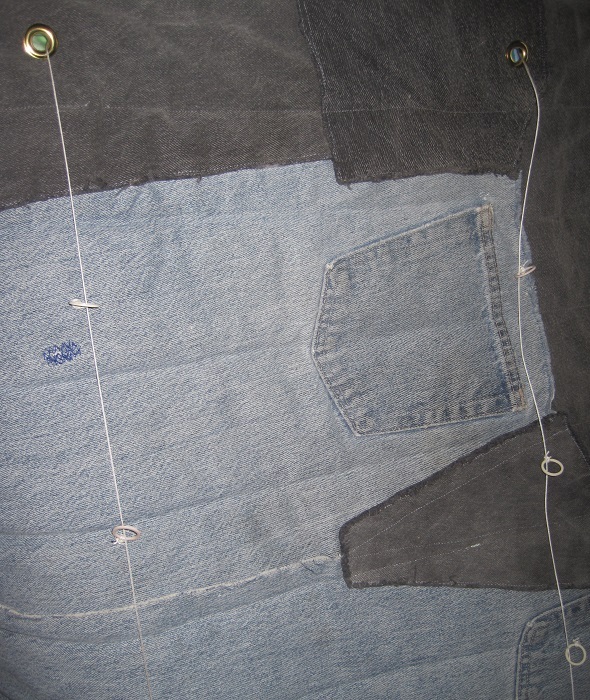 The jeans were hard to work with because I didn’t use the most stained regions (this means lots of old jeans) and the denim had lots of variability due to the variety of original weave, amount of wear, and that I didn’t align the grain. The conglomeration wanted to stretch in unpredictable ways. The batting is fleece from a neighbor’s stash. It was bought for a project and never used. The room facing fabric is from the thrift store. It was just big enough for this one window. The new quilt can be opened! The hardware was from the Roman shade that was in the window when we bought the house. 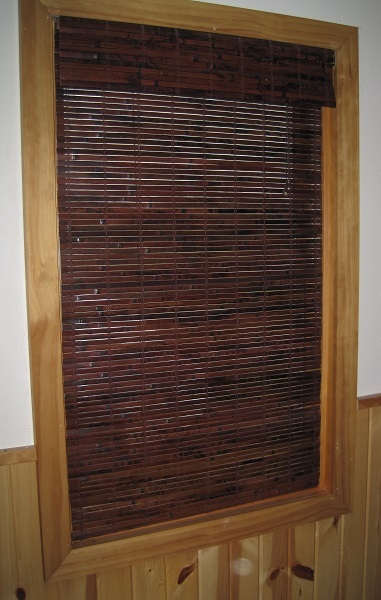 The pull had come apart some time ago and the shade was permanently in the closed position. Fabulously, I was able to use hardware that I saved from old bras to route the pull cord. Before you start thinking that I lead a depraved life to gain such satisfaction from reusing bits of old underwear, note that the rings don’t quite match. That’s because I’ve enjoyed a variety of colored underwear: white, pink, tan. Also, each set of hardware represents new underwear. New underwear provides a joy akin to that of new shoes. If you haven’t experienced this, perhaps you have too many clothes. Or perhaps you are more spiritually advanced than I. To dispel you the notion that I have an unhealthy fascination with underwear, I also collect hardware from bib overalls. Still not convinced? Oh well. Artists are rarely appreciated in their own time. What will I do differently next time? First of all, I will use whole cloth or match the grain on the window side of the quilt, mostly to expedite the process. Secondly, I will use a double-fold binding instead of self-binding the edges. This should give the quilt a tidier look. I like the haphazard look of the jeans-side, but the not-quite-even edge on the striped side isn’t as pleasing to me. 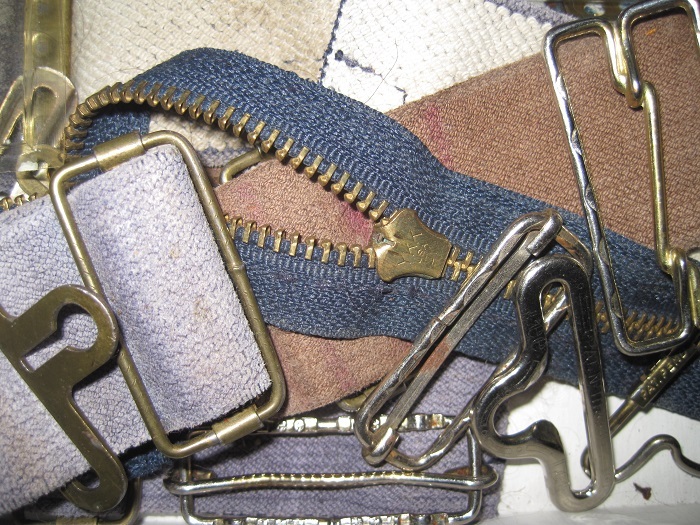 Third, I would sew the bra hardware on by machine, so that the stitching holds all of the layers together. I sewed this one by hand, only through the denim. I would use fleece again for a batting. It is light weight, insulating, and easy to sew through. Used blankets should be a good source of fleece. Did I mention this is my first machine quilting project of any size? It is. Now what to do with the old shade? Do you need a short chicken fence? That will have to wait until next spring. Until then, enjoy the warmth of winter by bundling up! This entry was posted in sewing and tagged projects, quilts, sewing. No need to covet. Just ask when you need some. I may have it! 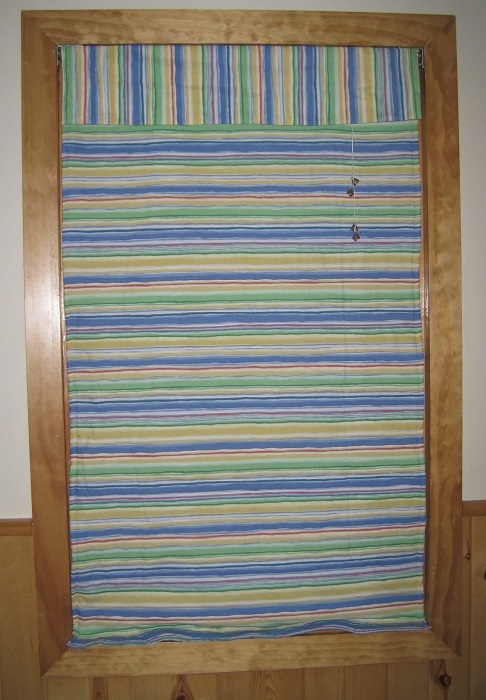 Very nice looking window quilt! And a great feeling to have it complete! Thanks! The fabric for the second one is cut and waiting to be pinned. The snow is a great motivator.